Packing: Plastic woven bag or kraft paper bag inner with plastic bag in 25kg/ 50kg/ 500kg/1000kg net. 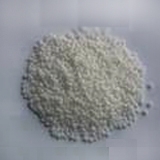 It is mainly used as flocculant in rubber latex and refrigerant. And it is also employed in oil exploratory well and sewage treatment, etc. In agriculture it is used as soiless culture and fast-effective fertilizer for acid soil. It also can be used to make fireworks and incandescent lamp chimney in light industry, to produce explosives in national defense industry and to paint negative pole in electron instrument industry. It is also a raw material in making other nitrates.